Anytime I’m interviewed about the history of Thanksgiving, the interviewers always seem to try to direct the conversation to popular myths about the “First Thanksgiving,” with the tiresome result that we end up mostly talking about what the Pilgrims had to eat. For my part, I’d rather discuss the far more important misconceptions most of us have about the Pilgrims: we tend to misunderstand why they came to America in the first place, how they saw themselves, and how they understood the celebration that we–not they–labeled the “First Thanksgiving.” Between now and Thursday I thought I would share some past posts that speak to those foundational questions. I hope you enjoy. In Search of Religious Freedom? Compounding these challenges was what Bradford called “the hardness of the place.” If Holland was a hard place to raise strong families, it was an even harder place to make a living. Leiden was a crowded, rapidly growing city. Most houses were ridiculously small by our standards, some with no more than a couple hundred square feet of floor space. The typical weaver’s home was somewhat larger. It boasted three rooms—two on the main floor and one above—with a cistern under the main floor to collect rainwater, sometimes side by side with a pit for an indoor privy. In contrast to the seasonal rhythms of farm life, the pace of work was long, intense, and unrelenting. Probably half or more of the Separatist families became textile workers. In this era before the industrial revolution, cloth production was still a decentralized, labor intensive process, with countless families carding, spinning, or weaving in their own homes from dawn to dusk, six days a week, merely to keep body and soul together. Hunger and want had become their taskmaster. This life of “great labor and hard fare” was a threat to the church, Bradford repeatedly stressed. It discouraged Separatists in England from joining them, he believed, and tempted those in Leiden to return home. If religious freedom was to be thus linked with poverty, then there were some—too many—who would opt for the religious persecution of England over the religious freedom of Holland. And the challenge would only increase over time. Old age was creeping up on many of the congregation, indeed, was being hastened prematurely by “great and continual labor.” While the most resolute could endure such hardships in the prime of life, advancing age and declining strength would cause many either to “sink under their burdens” or reluctantly abandon the community in search of relief. In explaining the Pilgrim’s decision to leave Holland, William Bradford stressed the Pilgrim’s economic circumstances more than any other factor, but it is important that we hear correctly what he was saying. Bradford was not telling us that the Pilgrims left for America in search of the “American Dream” or primarily to maximize their own individual well being. In Bradford’s telling, it is impossible to separate the Pilgrims’ concerns about either the effects of Dutch culture or their economic circumstances from their concerns for the survival of their church. The leaders of the Leiden congregation may not have feared religious persecution, but they saw spiritual danger and decline on the horizon. The solution, the Pilgrim leaders believed, was to “take away these discouragements” by relocating to a place with greater economic opportunity as part of a cooperative mission to preserve their covenant community. If the congregation did not collectively “dislodge . 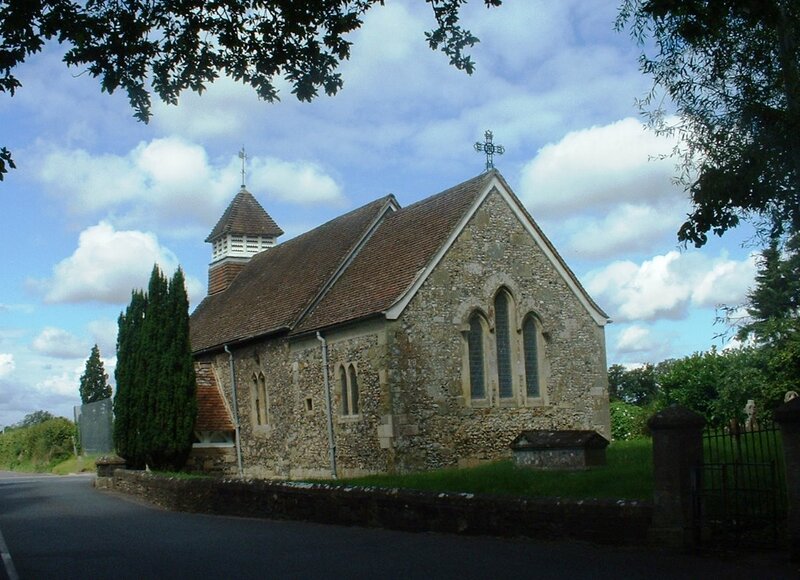 . . to some place of better advantage,” and soon, the church seemed destined to erode like the banks of a stream, as one by one, families and individuals slipped away. So where does this leave us? Were the Pilgrims coming to America to flee religious persecution? Not at all. Were they motivated by a religious impulse? Absolutely. But why is it important to make these seemingly fine distinctions? Is this just another exercise in academic hair-splitting? I don’t think so. In fact, I think that the implications of getting the Pilgrims’ motives rights are huge. Scorching Sun or Strangling Thorns? As I re-read the Pilgrims’ words, I find myself meditating on Jesus’ parable of the sower. You remember how the sower casts his seed (the word of God), and it falls on multiple kinds of ground, not all of which prove fruitful. The seed that lands on stony ground sprouts immediately but the plant withers under the heat of the noonday sun, while the seed cast among thorns springs up and then is choked by the surrounding weeds. The former, Jesus explained to His disciples, represents those who receive the word gladly, but stumble “when tribulation or persecution arises for the word’s sake” (Mark 4:17). The latter stands for those who allow the word to be choked by “the cares of this world, the deceitfulness of riches, and the desires for other things” (Mark 4:19). In emphasizing the Pilgrims’ “search for religious freedom,” we inadvertently make the primary menace in their story the heat of persecution. Persecution led them to leave England for Holland, but it was not the primary reason that they came to America. As the Pilgrim writers saw it, the principal threat to their congregation in Holland was not the scorching sun, but strangling thorns. The difference matters, particularly if we’re approaching the Pilgrims’ moment in history as an opportunity to learn from them. It broadens the kind of conversation we have with them and makes it more relevant. When we hear of the Pilgrims’ resolve in the face of persecution, we may nod our heads admiringly and meditate on the courage of their convictions. Perhaps we will even ask ourselves how we would respond if, God forbid, we were to endure the same trial. And yet the danger seems so remote, the question so comfortably hypothetical. Whatever limitations we may chafe against in the public square, as Christians in the United States we don’t have to worry that the government will send us to prison unless we worship in the church that it chooses and interpret the Bible in the manner that it dictates. Don’t misunderstand me. I’m not suggesting that we never ask the question. Posing it can remind us to be grateful for the freedom we enjoy. It may inspire us to greater vigilance in preserving that freedom and heighten our concern for Christians around the world who cannot take such freedom for granted. These are good things. But I am suggesting that we not dwell overlong on the question. I’m dubious of the value of moral reflection that focuses on hypothetical circumstances. Avowals of how we would respond to imaginary adversity are worth pretty much what they cost us. Character isn’t forged in the abstract, but in the concrete crucible of everyday life, in the myriad mundane decisions that both shape and reveal the heart’s deepest loves. Here the Pilgrims’ struggle with “thorns” speaks to us. Compared to the dangers they faced in England, their hardships in Holland were so . . . ordinary. I don’t mean to minimize them, but merely to point out that they are difficulties we are more likely to relate to. They worried about their children’s future. They feared the effects of a corrupt and permissive culture. They had a hard time making ends meet. They wondered how they would provide for themselves in old age. Does any of this sound familiar? When we insist that the Pilgrims came to America “in search of religious freedom,” we tell their story in a way that they themselves wouldn’t recognize. In the process, we make their story primarily a source of ammunition for the culture wars. Frustrated by increasing governmental infringement on religious expression, we remind the unbelieving culture around us that “our forefathers” who “founded” this country were driven above all by a commitment to religious liberty. But while we’re bludgeoning secularists with the Pilgrim story, we ignore the aspects of their story that might cast a light into our own hearts. They struggled with fundamental questions still relevant to us today: What is the true cost of discipleship? What must we sacrifice in pursuit of the kingdom? How can we “shine as lights in the world” (Philippians 2:15) and keep ourselves “unspotted from the world” (James 1:27)? What sort of obligation do we owe our local churches, and how do we balance that duty with family commitments and individual desires? What does it look like to “seek first the kingdom of God” and can we really trust God to provide for all our other needs? As Christians, these are crucial questions we need to revisit regularly. We might even consider discussing them with our families tomorrow as part of our Thanksgiving celebrations. I hope to return to semi-regular posting with the new year, but it occurred to me just now that Thanksgiving is only two and a half weeks away, so I thought I would take the time to engage in some shameless self-promotion. On the possibility that some of you might be interested in a book about the history of the holiday, I will be bold and suggest that you consider my own: The First Thanksgiving: What the Real Story Tells Us about Loving God and Learning from History. The book came out in the fall of 2013 from Intervarsity Press, and it was a labor of love. For years I had been gradually developing a new sense of vocation. I believe that academic historians write too much for each other, leaving the public to learn about the past from pastors, talk-show hosts, rap musicians, and other public celebrities. As a Christian historian, I have come to believe that part of my calling is to be a historian for Christians outside the Academy. If you are a Christian who is interested in American history, I want to be in conversation with you about what it means to think Christianly and historically about the American past. That is why I started this blog a few years back, and that is why I spent several years conducting research on the Pilgrims and the First Thanksgiving. I didn’t write The First Thanksgiving primarily because I was enamored with the story and wanted to re-tell it accurately (although I hoped to do so). Rather, it gradually dawned on me that this familiar story provided the perfect framework for exploring what it means, from a Christian perspective, to remember the past faithfully. The story of the First Thanksgiving is central to how we, as Americans, remember our origins. The subsequent development of the Thanksgiving holiday speaks volumes about how we have defined our identity across the centuries. As Christians, our challenge is to “take every thought captive in obedience to Christ” (II Corinthians 10:5), including our thinking about our national heritage. Thanksgiving is a good place to start. I’ve shared the poem below before, but I thought I would circulate it again as we near the Thanksgiving holiday. I first came across it this summer when reading a book recommended to the Wheaton faculty: Christine Pohl’s Living into Community: Cultivating Practices that Sustain Us, by Christine Pohl. The first practice that Pohl highlights is the expression of gratitude, and much of what she had to say hit me right between the eyes. 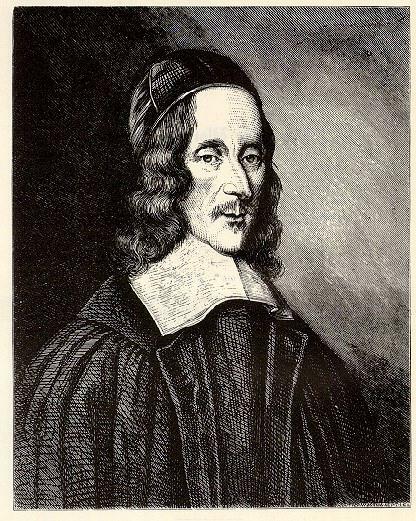 The poem that Pohl alerted me to is “Gratefulness,” by the seventeenth-century English poet George Herbert. I have previously written about Herbert with regard to his marvelous poem “Joseph’s Coat,” which is probably my favorite poem by any author. “Gratefulness” also impresses me deeply. I love the plea with which Herbert opens and concludes his poem: the plea for a grateful heart that sees God’s grace and mercy in all things. 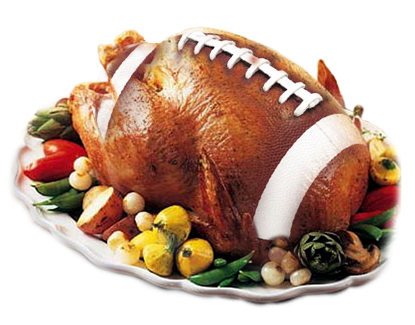 So how old, really, is the connection between Thanksgiving and football? A lot older than most of us would guess. 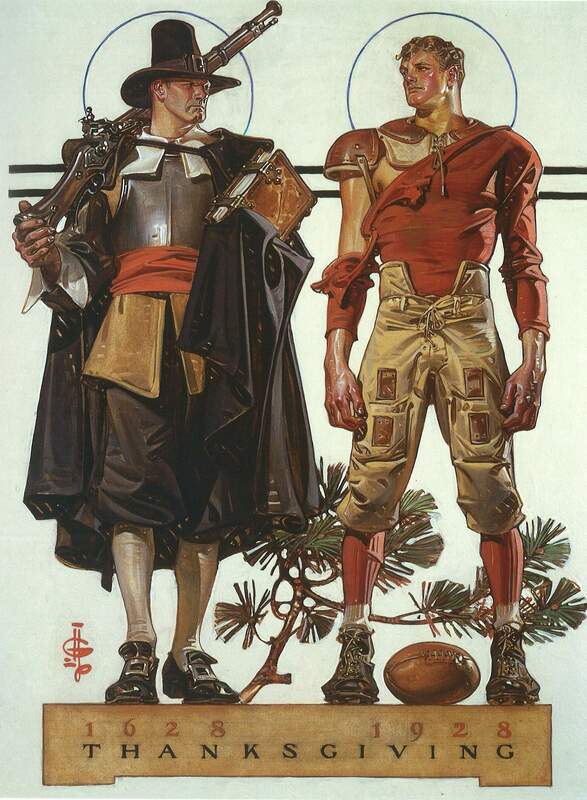 As early as 1928, the Saturday Evening Post cover below suggested the centrality of football to America’s Thanksgiving. Notice the almost perfect symmetry between the two figures. From the November 24, 1928 cover of the Saturday Evening Post. The cartoon below suggests that the Thanksgiving-football connection is even older, however. This very busy cartoon by Samuel Ehrhart appeared in Puck in the year 1912. (Puck was a popular national humor magazine published between 1871 and 1918.) Notice how the crowds are flocking to see the advertised football contest pitting “Ye Pilgrims versus Ye Indians” at 2:00 p.m. Even before WWI, then, Americans had come to take for granted the link between Thanksgiving and football, and the cartoon’s gag consists of imagining our ancestors from the 17th century as enjoying the same pastime. But the Thanksgiving-football connection actually goes back much further than this. One hundred thirty-eight years ago—in 1876—the newly formed Intercollegiate Football Association (with all of four member schools) determined to hold its first championship game in New York City on Thanksgiving Day. In no time at all the annual Thanksgiving Day championship game had become the country’s premier sporting event, drawing crowds upwards of forty thousand by the early 1890s. The year of this warning was 1897. In recent years I’ve become more and more fascinated with popular historical memory. It’s an odd phenomenon, really. By definition, it exists at the intersection between past and present. In the best case, it’s informed (at least somewhat) by historical evidence, but it’s always influenced by the contemporary context as well. This means that one of the best ways to track the changing values of a culture is to examine how popular memory of a particular historical event differs over time. The memory of the Pilgrims and the First Thanksgiving is a case in point. 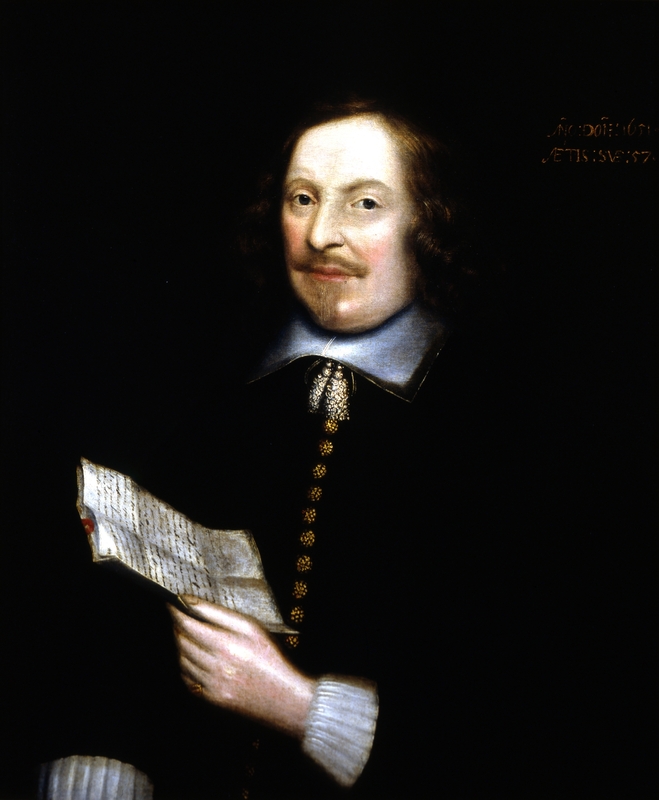 Edward Winslow, unknown artist, 1651. Winslow sat for the portrait while in England, three decades after penning the only first-hand account of the First Thanksgiving. Rare in England, Mourt’s Relation was rarer still in the American colonies, and by the beginning of the eighteenth century there was probably not a single copy of it in all of New England. With neither oral tradition nor a written record to keep it alive, the 1621 event gradually faded until it vanished entirely. The opposite was true of Thanksgiving itself. As memory of the First Thanksgiving died away, the celebration of Thanksgiving became more popular, not less. The original Pilgrims had been very skeptical of regular holy days. (Remember that our word “holiday” is just an elision of the two words “holy day.”) The Pilgrims associated regular holidays with the perceived abuses of Catholicism, and in general the only true holy day that they celebrated regularly was the Lord’s Day every Sunday. Their descendants, however, gradually forgot or rejected their ancestors’ hostility to regularly scheduled holidays. By the 1690s they had adopted a pattern of annual springtime Fast Days, to beseech God’s blessing on the crop about to be planted, and autumn Thanksgiving Days, in which they thanked the Lord for the harvest just past. While the custom of springtime fasts never caught on elsewhere, the celebration of regular autumn Thanksgivings spread across New England during the eighteenth century, expanded to the Midwest after the War of 1812, and began to catch on in the Upper South by the 1840s. Thanksgiving was becoming a beloved American holiday, just not one linked to the Pilgrims. 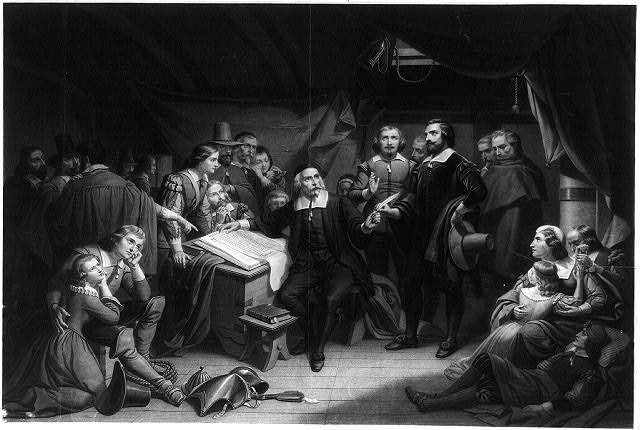 Since the late-18th century the Pilgrims had been growing in importance in American memory, but the part that they played in the national story was as generic “founders” or “forefathers.” Thinking of their national story as a series of dramatic images, Americans imagined the Pilgrims huddled on Plymouth Rock, not gathered around the Thanksgiving table. Out of 223 colonial or state thanksgiving proclamations I have located from the years 1676-1840, not a single one refers to the Pilgrims, even euphemistically. It was as if the Pilgrims’ 1621 celebration had never occurred. Americans thought of their Thanksgiving tradition as coming mainly from New England Puritans but did not think of it as originating in a particular historical moment. As late as 1840, the “First Thanksgiving” was simply not a part of historical memory. The result was that Americans gradually became more and more aware of the Pilgrims’ celebration. Notice I said aware, not impressed. Generations would pass before Americans widely embraced the story of the Pilgrims’ First Thanksgiving as an important chapter in the early history of America. So why was this? I can think of three reasons. For starters, Winslow’s account showed that the Wampanoag Indians had played a prominent role in the Pilgrims’ celebration. Winslow had devoted only one sentence to the Wampanoag, but that lone sentence made two disturbing facts undeniable: the majority of those present at the “First Thanksgiving” had been Indians, not Pilgrims, and the two groups had interacted peacefully. The revelation was jarring, especially outside of the Northeast. 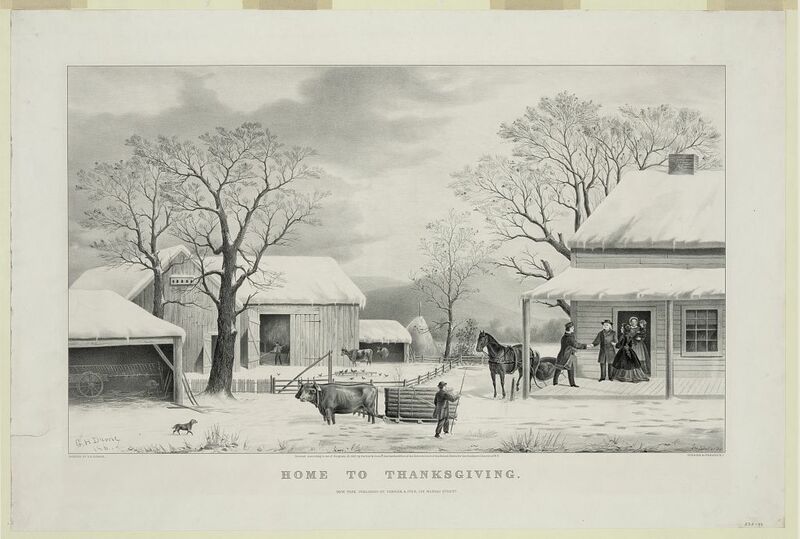 In 1841, Thanksgiving was still almost exclusively a northern holiday, flourishing particularly in New England and in areas farther west to which New Englanders had migrated in large numbers. In New England—where few Native Americans remained in 1841—it was possible for Yankees to romanticize the “noble savage” and to imagine a carefully circumscribed role for Indians in their beloved regional holiday. Elsewhere this was far from easy. In 1841 the southeastern United states was only three years removed from the infamous “Trail of Tears,” the forced relocation of the Cherokee Indians from Georgia to Oklahoma that had resulted in more than four thousand Cherokee deaths. West of the Mississippi, violence would continue to punctuate Indian-white relations for another two generations, on scattered battlefields with evocative names like Sand Creek, Little Big Horn, and Wounded Knee. Correspondingly, until long after the Civil War, most artistic representations of Thanksgiving that included Native Americans portrayed them as openly hostile, and it is no coincidence that the now familiar image of Indians and Pilgrims sitting around a common table dates from the early twentieth century. By that time America’s Indian wars were comfortably past, and it would begin to be broadly possible in the public mind to reinterpret the place of Native Americans at the Thanksgiving table. But that would come later. In 1841 the national policy toward Native Americans was not assimilation but removal, and in that respect the First Thanksgiving fit awkwardly in the national story. 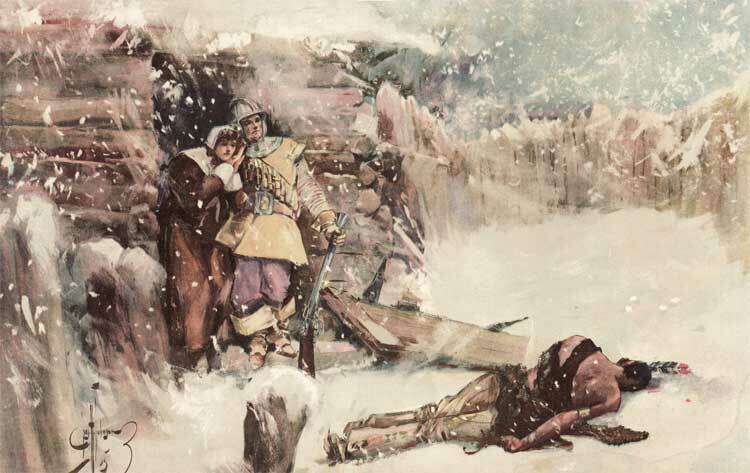 This 1877 painting by Charles Howard Johnson portrays Native Americas as hostile to the Pilgrims. It was the late-19th century before the Pilgrims and Indians began to be portrayed as friends. Keep in mind also the growing sectional rivalry of the period. Winslow’s account of the 1621 celebration was republished just as tensions between North and South were beginning to mount. Unfortunately, fans of Thanksgiving had traditionally emphasized its regional ties. New England magazines and newspapers boasted that the holiday was “strictly one of New England origin.” The custom was “precious to every New-England man,” and without its recurrence “a Yankee could scarce comprehend that the year had passed.” More to the point, white southerners also associated the holiday with New England, and that made it suspect in their eyes. Even as it gradually expanded southward, there was a lingering tendency among southerners to think of Thanksgiving as a holiday invented by Pharisaical Yankees to take the place of Christmas, which Puritans had traditionally spurned. A final reason for the Pilgrims’ limited usefulness to mid-nineteenth century Americans, I believe, is that they had come to celebrate Thanksgiving in a way that the Pilgrims would not have recognized, much less approved. This had not been intentional. Americans’ Thanksgiving traditions had developed while the country knew nothing about the First Thanksgiving. And then, after two centuries, in the span of less than two decades the veil was pulled back. The first step had been the republication of Mourt’s Relation, but much more was involved. A decade later came the release of three volumes of writings and sermons from the Pilgrims’ pastor in Leiden, John Robinson. Five years after that came the dramatic publication of Pilgrim Governor William Bradford’s long-lost history Of Plymouth Plantation. Collectively, these sources revealed that the Pilgrims had roundly criticized the Church of England for its numerous annual holidays. All three underscored the Pilgrims’ conviction that Days of Thanksgiving should be proclaimed irregularly and should center on public worship. Unfortunately for the Pilgrims’ popularity, mid-nineteenth-century Americans had precisely reversed these criteria. By the eve of the Civil War, the “traditional American Thanksgiving” was a regularly scheduled celebration centered inside the home. If the Pilgrims’ story was to become an important part of Thanksgiving, there was much that would have to change. We’ll talk about those changes next time. Just a few images of Thanksgiving that come to my mind today as I read about current events. They don’t add up to a clear historical narrative–just food for thought. 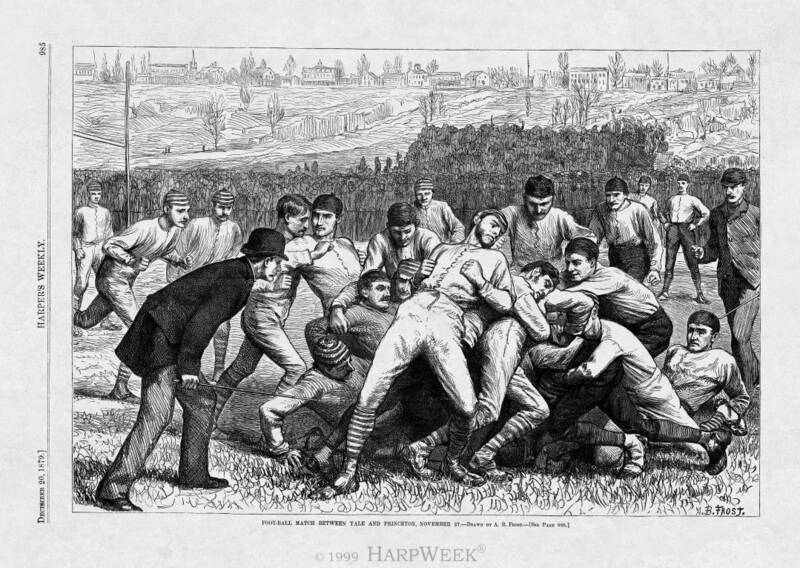 “Football Match between Yale and Princeton,” Harper’s Weekly, 1879. 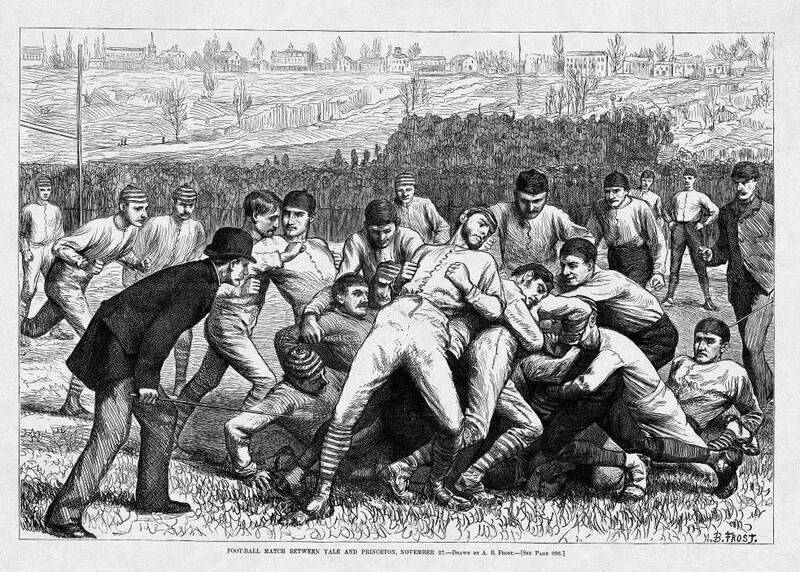 In 1876 the newly formed Intercollegiate Football Association held its championship game on Thanksgiving Day in New York City, and in short order the annual Thanksgiving Day contest had evolved into the country’s premier sporting event, drawing crowds upwards of forty thousand by the early 1890s. “Thanksgiving: A Study in Proportion,” Udo Keppler, 1912. By the early twentieth century, numerous commentators feared that Thanksgiving had become nothing more than a day for pleasure and self-indulgence. 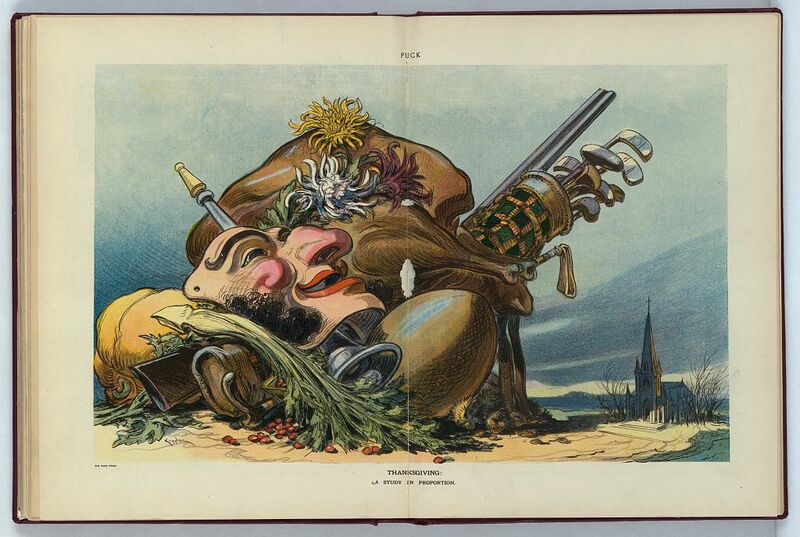 This Puck cartoon shows a pile of large items representing the pleasures of the holiday—a football, golf clubs, a shotgun, a theater mask and, of course, a turkey—towering over a dark and probably empty church in the background. “First Thanksgiving at Plymouth,” Jeannie Brownscombe, 1914. 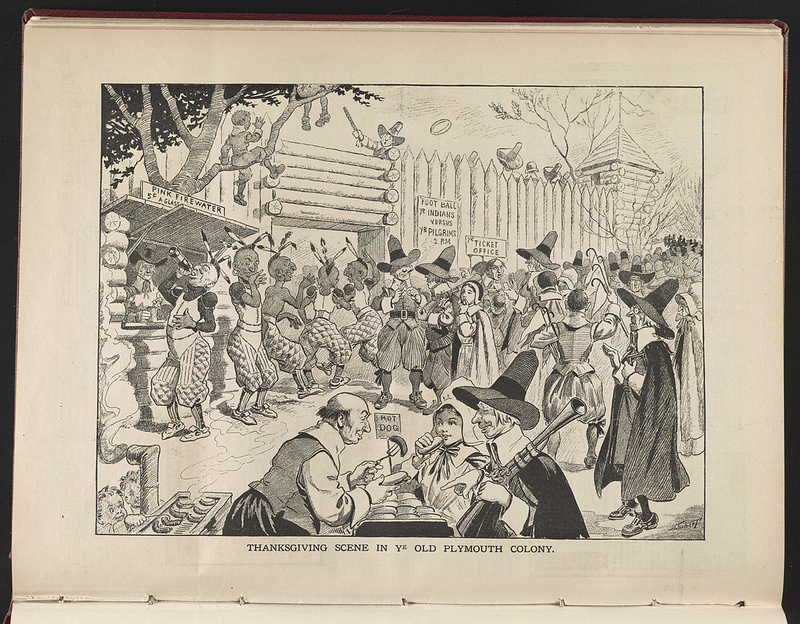 On the eve of WWI, Brownscombe’s imaginative recreation of the “First Thanksgiving” helped link Thanksgiving with the Pilgrims’ 1621 celebration in the public mind. Although full of historical inaccuracies, the artist did rightly portray the feast as a large, public, outdoor event. “Freedom from Want,” Norman Rockwell, 1943. 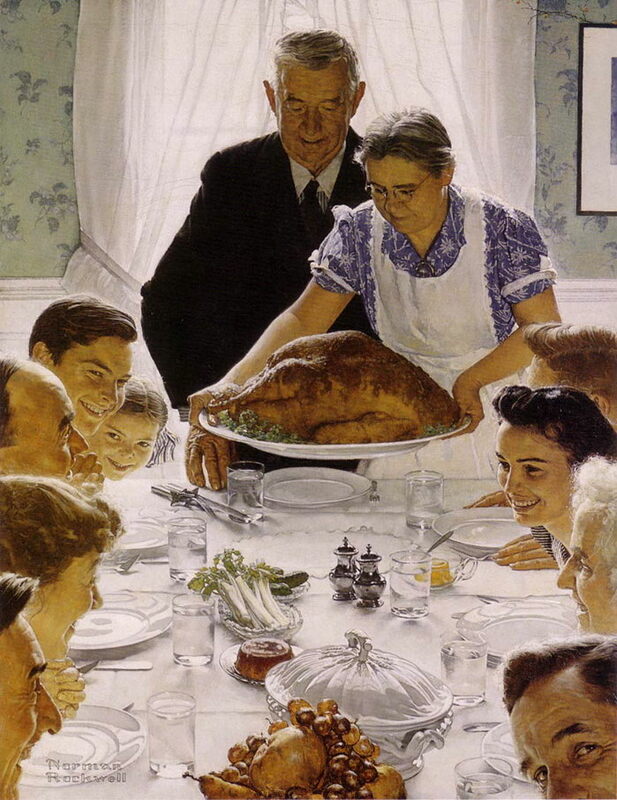 This now iconic portrayal of a family Thanksgiving meal graced the cover of the Saturday Evening Post in the midst of World War Two. Thanksgiving Night, 2015? 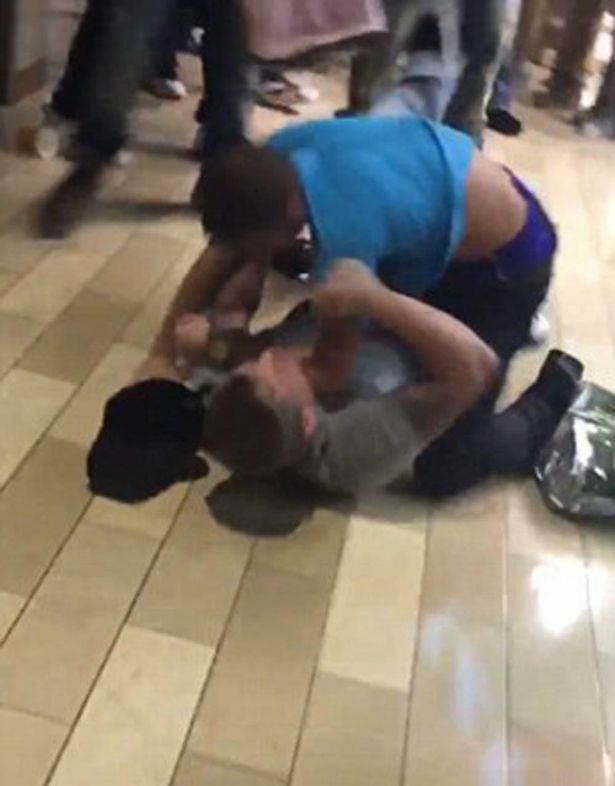 This spontaneous photograph of early Black Friday violence has swept the internet. TWENTY-TWO days to Thanksgiving and counting. As an alternative to the ubiquitous countdown to Black Friday, each weekday between now and Thanksgiving I will be posting brief essays on the history of the First Thanksgiving and its place in American memory. Football wasn’t the only option for those inclined to pleasure on this once “holy day,” however. By the end of the century there were car races in Chicago; bicycle races in Los Angeles; balls, parties, golf tournaments, and theater matinees in the nation’s capital. While a West Coast journalist insisted that “the mingling of sports with prayer harms no well-regulated normal community,” a Chicago newsman predicted that “the churches will have to devise some more attractive program . . . if the religious feature of Thanksgiving Day is to be preserved.” The year of this warning was 1897.